* This reflects where 13,700 Full color Cartoon Maps Posters were distributed in Athens, GA by January 30, 2009. These are "exact numbers," distributed in boxes of 100. This also reflects where future posters will be distributed. 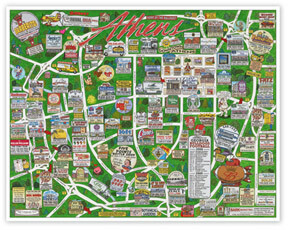 13,700 Posters @ 94 LOCATIONS in Athens, GA Area - Distributed by Jan. 30, 2009 - Exact numbers.